The Beyond Building Construmat 2017 is taking place in Barcelona from the 23th to the 26th of May. This international construction meeting is one of the most important fairs of the sector. The event will take place, as in previous editions, at the 2nd pavilion of the Gran Vía of Barcelona fairgrounds (Fira Barcelona). On this occasion, the innovation and the digitalization will be the key topics of the edition. The main goals of this meeting are to show and introduce new trends, ideas and materials that will become important in the construction and architectural sector in the 21st century. Self-sufficient buildings, 3D design and production, applied robotics… are some of the possibilities offered by modern construction technology. A business area that has suffered an important crisis lately and which, fortunately, is recovering nowadays. In fact, Construmat 2017 foresees a 20% growth in the attendants to the meeting in comparison with last edition. Bateig Natural Stone will be attending the 20th edition of the fair as part of the 300 exhibitor companies. Our stand will be C383. There, you will be able to check the quality and exclusiveness of our natural stone. A building material that, thanks to its own characteristics, offers a wide range of possibilities. Besides, we are also specialists in CNC and, for this reason, we can work natural stone according to the clients’ needs. Some of our projects include outstanding facades, inner walls, floorings and fireplaces. Mosaics and bath furniture are also an interesting option. Not to mention the restoration of historical buildings as the Madrid Cityhall. As you will discover, all of our natural stone projects are unique. What can we find at the 20th edition of Construmat 2017? The 20th edition of Construmat 2017 will be divided in 4 main areas called “arenas”. In the first place, we will find the Arena Industry with more than 30.000 square meters, where the commercial exhibition will take place. The second area is the Arena Future, a place that will be focused on showing the main advances in the sector. The Arena Talks will include conferences about Public housing (23rd of May), Circular economy (26th of May) and Innovation (24th and 25th of May). Arena Meetings is the business development platform for the sector, the best way to get in touch with other professionals. You can check the programming and other relevant information on their website. 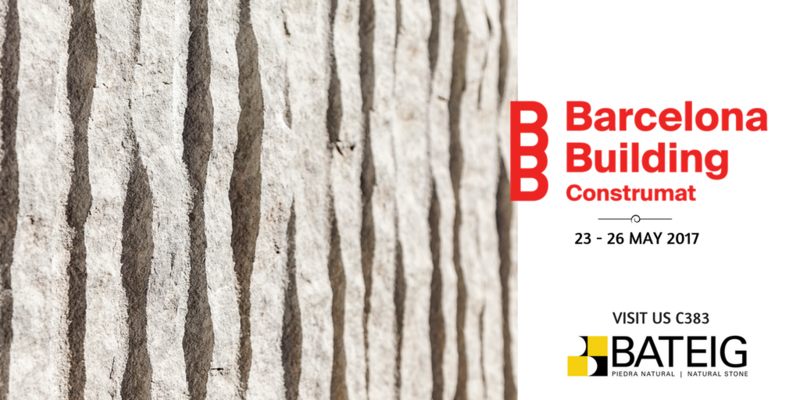 Furthermore, the 24th of May will take place the 17th edition of the BBConstrumat 2017 Awards. The purpose of these awards is to recognise and promote the projects and initiatives that represent and generate added value in the construction sector. Check the categories available for the BBConstrumat 2017 Awards. In conclusion, Construmat 2017 is an international benchmark of innovation and an important forum for knowledge and business. An interesting way to stablish commercial relationships with constructors, engineers and architects. Construmat 2017 is one of the most important construction fairs and Bateig couldn’t miss it out.